CSP « Global Market Insights, Inc. The global shift towards clean, affordable and reliable electricity along with rising focus towards curbing CO2 emissions will drive solar EPC market growth in the upcoming years. Reportedly, solar PV is recorded to be one of the most installed power generation technologies across the globe in recent years, having been accountable for the deployment of extensive new capacity than fossil fuels and nuclear combined. As per SolarPower Europe, in 2017, a total of 99.1 GW of on-grid solar systems were installed across the globe – depicting almost 30% y-o-y growth over the 76.6 GW capacity in 2016, thereby indicating that solar EPC industry is here to stay. In terms of installations, it would be apt to quote that roof-top installations are likely to depict maximum instatement, specially across the commercial and residential sectors in the years to come. Roof-top solar is increasingly cost-effective for business owners, homeowners and communities. Affordable technology prices, supportive financing and the growing network of solar companies and financers are anticipated to help reduce the prices for household roof-top systems in the U.S.
Customers generally prefer roof-top PVs as they don’t require a dedicated land area for installation and can efficiently occupy roof space that is widely available even in urban areas. Apparently, India’s National Solar Mission shares similar goals on using roof-top PVs, as it officially announced plans to install 100 GW of solar by 2022, of which 40 GW would be credited to rooftop solar. In essence, the integration of decentralized generation units in order to cater to the growing demand for energy will massively augment solar EPC market from roof-top installations over 2019-2025. Large-scale utility installation will positively influence the global solar EPC market. The utility sector, that mainly deploys ground-mounted solar power systems, is touted to have been recorded as one of the most lucrative end-use sectors for the solar EPC market in 2018. With the escalating growth in smart cities and electric vehicles reaching the masses, there is increasing pressure on the utility sector for delivering sustainable energy to manufacturing industries and customers. Rising focus toward curbing CO2 emissions from large industries and power generating plants in tandem with favorable fiscal benefits on the grounds of the development of energy efficient solar systems will further augment solar EPC industry size from utility applications. Geographically, speaking the United States is touted to emerge as one of the most prominent regional markets for the solar EPC industry. As per estimates, the U.S. solar EPC market is projected to exceed $14 billion by 2025, driven by the fact that solar power has proven to be a strong driver of the region’s economic growth. Reportedly, in 2014, the U.S. solar industry employed over 170,000 people, offering a job growth rate that positively influenced the overall economy. Regulatory measures to reduce dependence on conventional fossil fuels coupled with financial funding to integrate renewable energy will also stimulate product penetration. In addition to offering new jobs, the U.S. government, in 2017, proposed plans to decrease in their tax reforms by reducing corporate taxes in a bid to boost the clean energy business potential, that would further stimulate the U.S. solar EPC market growth. Another region that has gained traction in solar EPC market is the Asia Pacific, on account of the rising investments in the renewable sector backed by favorable government initiatives. Investment subsidies, positive regulatory programs, renewable integration targets and government reforms have certainly reinforced the APAC solar EPC industry in recent years. For instance, recently India’s Cabinet Committee on Economic Affairs (CCEA) approved a proposal to set up 12 GW of solar projects using locally-made equipment by 2023, an initiative the will certainly boost the region’s economic growth, in turn, paving the way for the expansion of APAC solar EPC industry. A vital form of contracting procedure, solar EPC is extensively used to provide end-to-end services associated with construction, design, procurement and commissioning. Powered by the growing demand by emerging countries for clean, sustainable electricity and the robust efforts by industry players to develop new high-efficient systems, the global solar PV market is expected to emerge as one of the most remunerative verticals of the overall energy sphere. This entry was posted in Sustainable & Smart Technologies and tagged Commercial, CSP, Ground Mounted, Industrial, Institutional, PV, Residential, Rooftop, Solar EPC Industry, Solar EPC Market, Solar EPC Market Report, Solar EPC Market Share, Solar EPC Market Size, Utility. Concentrated solar power market is gaining an edge successfully in improving profitability and developing new revenue streams. Growth of the concentrated solar power industry is increasingly being driven by government policies aimed at reducing GHG emissions and balancing the fossil fuel depletion. For instance, the U.S. treasury department and the state government have awarded tax credits to CPS projects which make use of clean energy. Another prominent example is the Office of Energy Efficiency and Renewable Energy, which provided funds of approximately USD 9 million to 6 CSP projects to achieve a substantial reduction in the prices and ensure technological advancements. The mounting need for efficient renewable energy sources for large scale electricity generation, owing to rapid industrialization and urbanization is likely to propel the global concentrated solar power industry. As per a report by Global Market Insights Inc., Concentrated Solar Power Market is anticipated to exceed 24 GW by 2025. Amongst the various types of solar power generators based on technological bifurcation, parabolic troughs accounted for over 70% of the global concentrated solar power industry in 2015. High efficiency and low cost of the parabolic troughs is gaining preference in the mass market. Linear Fresnel, power tower, and dish are the other technologies used in solar power generators witnessing noticeable growth. Linear Fresnel concentrated solar power industry is anticipated to surpass USD 9 billion by 2025. In addition, improved performance, low cost, high storage, high efficiency, and high capacity will set a promising growth for the power tower CSP market. This entry was posted in Sustainable & Smart Technologies and tagged Concentrated Solar Power, Concentrated Solar Power (CSP) Market, Concentrated Solar Power Market, Concentrated Solar Power Market Forecast, Concentrated Solar Power Market Growth, Concentrated Solar Power Market Size, Concentrated Solar Power Overview, CSP, Dish, Global Concentrated Solar Power Market, Linear Fresnel Concentrated Solar Power, Parabolic, Parabolic Troughs, Power Tower. Solar power has emerged from a niche segment to mainstream electricity source, the prime factor that has upscaled solar tracker market demand immensely. Solar trackers help in improving the energy output by orienting the payloads toward the sun. In fact, estimates claim that these trackers are capable of increasing the power output by almost 10-25% than their conventional counterparts, depending upon the geographic location of the tracking systems. Undoubtedly, technological innovations have played a pivotal role proliferating the overall market trends. For instance, NEXTracker, one of the pioneers of solar tracker industry, has recently launched a solar plus energy storage solution named NX Fusion Plus, reportedly in November 2016. This groundbreaking innovation integrates a self-powered single-axis tracker, battery, software, and inverter into a single platform to provide a better ROI to the solar plant owner. This is arguably one of the biggest breakthroughs of recent times in the solar tracker market landscape, given the fact it is claimed to be the first of its kind. Some of the other biggies involved in solar tracker industry include Grupo Calvijo, Abengoa, SunPower, First Solar, and Wuxi Hao Solar, and, Array Technologies. Favorable incentives such as soft loans, feed-in-tariffs, tax rebates implemented by governments of developing & developed nations have complemented solar tracker market penetration. Clean energy demand has witnessed a comprehensive upsurge with the growing urbanization, solar power demand being at the pinnacle. In this regard, it is important to note that the economics of solar power market has been improving rapidly. A large number of leading companies are inking solar deals not only to experience green credentials but also to diversify their supply sources at comparatively lower costs. 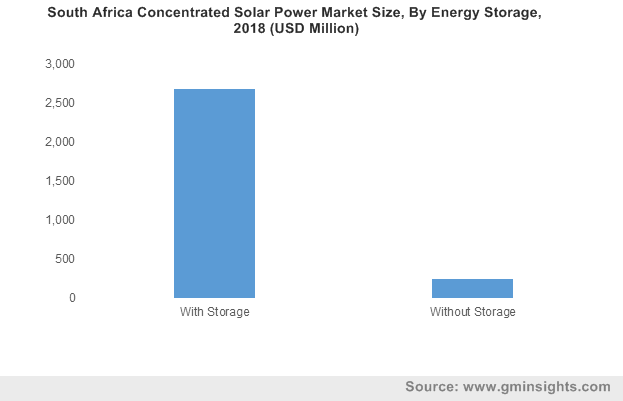 Alongside, increasing global concern regarding the detrimental consequences of greenhouse gas emission has brought a renewed attention to the solar power sector, with a subsequent demand for solar tracker industry as well. 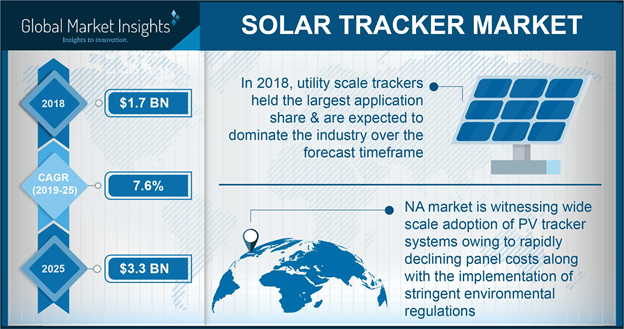 As per Global Market Insights, Inc. global solar tracker industry is forecast to exceed a revenue of USD 27 billion by the end of 2024, exceeding an annual installation of 70 GW over the coming seven years. Speaking along the similar lines, a diversified range of strategies implemented by international organizations pertaining to the reduction of greenhouse gas emissions has catered solar tracker market commercialization. For instance, the Energy Star Program initiated by the United States EPA demonstrates the profitability potential by the reduction of GHG emission and energy consumption. The program deals with providing the consumers and the organizations enough technical information regarding the benefits of choosing energy efficient solutions. Driven by a favorable government participation in the deployment of energy efficient solutions, U.S. solar tracker industry is forecast to exceed an installation of 12GW by 2024. Indonesia has also profoundly enlisted its name in the global industry landscape, taking into consideration the country’s National Action Plan of greenhouse gas reduction. Under the presidential reduction plan, the country has set a target to reduce GHG emission by 26% by 2020. Solar tracker market is indirectly characterized by such exemplary initiations across the globe, in extension to which the market investors are betting big on the commercialization landscape. The growth of solar tracker industry is extremely dynamic and varies strongly with geographies. While many countries have already incorporated solar trackers in their solar panel for a more energy efficient output, there are many underdeveloped regions that are still hesitant about deploying this highly efficient technology. Subject to their inbuilt complex design and operation, these trackers are slightly more expensive than their stationary counterparts, which can be taken as a stumbling obstacle hindering the market penetration. However, ongoing electrification programs promoting deployment of energy efficient solutions along with several incentive benefits pertaining to clean energy power generation is expected to upswing solar tracker market demand in the coming years. This entry was posted in Sustainable & Smart Technologies and tagged CPV, CSP, Global PV Tracker Market, Global Solar Tracker Market, Solar PV, Solar Tracker, Solar Tracker Industry, Solar Tracker Market, Solar Tracker Market Analysis, Solar Tracker Market Forecast, Solar Tracker Market Share, Solar Tracker Market Size, Solar Tracker Market Trends, Solar Tracker Report, Solar Tracking.